The restoration of the 1927 Australian steamship John Oxley to full operational condition is a major project being undertaken by Sydney Heritage Fleet. It is intended to preserve this historic vessel for future generations of Australians as the only operating example of the most common and significant form of early 20th century coastal travel. Coastal steamships and travel has been largely forgotten. This project will bring back to live one of these vessels and recreate that experience. Her cultural significance stems from the fact that she is the last steam engined coastal steamship left in Australian waters today. While some local and overseas ferries, steam tugs, colliers and a sludge carrier remain; there are no coastal passenger/cargo steamships of her size remaining intact today. John Oxley represents a period in shipping where crews were rigidly separated by status. Deck crew and firemen lived forward in shared quarters, while officers and pilots lived aft in cabins. The master’s cabin was located on the boat deck. The crew worked long hours under conditions that were unacceptable to their unions; causing disputes as early as the late 1940′s. It may be asked how a Scottish built steamship, ordered for and operated throughout its active career by the Queensland State Government, is of international and national historic significance. The answer lies in an understanding of the nature of shipping in the early 20th century, Australia’s early maritime history, the significance of John Oxley to that history, and the broadening focus of the SHF. John Oxley is Clyde built, meaning she was constructed in that part of Scotland that was world famous for quality, technology and the sheer numbers of ships built. As such she represents the tradition of shipbuilding with its roots in the Clyde and nearby tributaries. John Oxley with her riveted hull, teak decks, twin Scotch boilers and triple expansion steam engine is absolutely typical and one of the few remaining ships of her type, i.e. the coastal steam ship. Thousands like her were built, and like the sailing ships before her, are gone. John Oxley is the only remaining example of the large numbers of similar vessels that once steamed off the Australian coast. She is a priceless asset of extraordinary significance to Australia’s maritime history. As in many areas of technological innovation, Australia was in the forefront of the use of steam for marine use. The first public operation of a steam driven vessel recorded in Australian waters occurred on Sydney Harbour on 1 June 1831 with the locally built Surprise powered by its 10 hp engine imported from England. The Sophia Jane built at Rotherhithe in 1826 arrived in Port Jackson in May 1831 under sail. 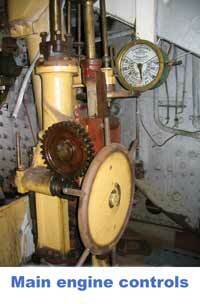 Its first steam trials occurred on 11 June 1831. The first Australian built steamer followed in the form of William the Fourth, now celebrated by a remarkable replica based in Newcastle NSW. Many more steam vessels were soon built and the first trans-Tasman steam voyage to New Zealand took place in 1847. In the decades that followed, dozens of steamships entered service between Australia and overseas and around the Australian coast. These vessels provided a regular and reliable service around our coastline, often faster and far more comfortable than early rail services. Australians were more likely to travel and move their produce and wares from port to port by steamship especially as road and rail networks then were in their infancy. The high watermark in terms of size and luxury was the decade before the Great War from 1914-1918. Steamships of up to 10,000 gross tons – some as big as many overseas mail liners – plied Australian coastal waters carrying passengers and cargo. Many hundreds were smaller and more unassuming; some of only a few hundred gross tons carrying modest amounts of cargo and handfuls of passengers. 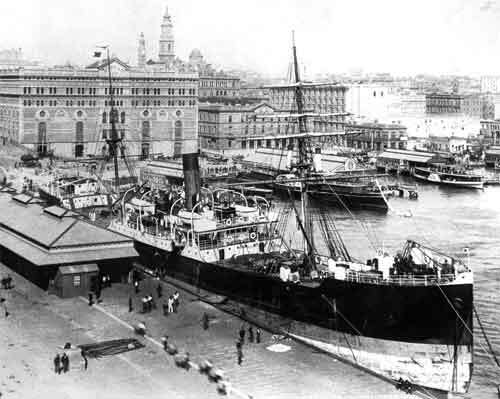 Between the wars, steamships continued to play the major role in Australia’s transport infrastructure. Coastal travel declined quickly after the Second World War and lingered on until the early fifties when industrial troubles, land and air transport finished it off. John Oxley is highly significant as the only classic example of the smaller type of coastal steamship. She is the last living embodiment in this country of a most significant part of our maritime social history.